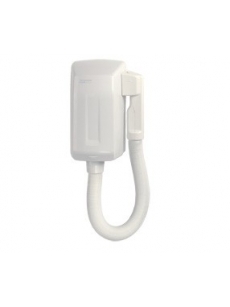 Hair Dryer SC0004 individual use, automatic (telephone type) without cord and plug to electricity. By buying this product you can collect up to 151 loyalty points. Your cart will total 151 loyalty points that can be converted into a voucher of 7,55 €. Smartflow® hair dryer is a bathroom wall mounting hair dryer with a functional, robust and trendy design that blends into any space perfectly such as hotels, hospitals and elderly care centers. main body and has a total power of 850 W.
flow, all of this with a low noise level and saving time and money.